One of my fondest childhood memories is of Sunday mornings when -- after enduring an hour of Sunday school -- we stopped at the corner store on the way home and were given 20c pocket money. I looked forward to this event every week, and much thought was put into the exchange of this high finance. When I was a child, 20c went a long way to filling a little white paper bag with lollies. And every Sunday, I stood in front of the glass cabinet that displayed rows of brightly coloured confectionery and made my considered choice. Years on, I still linger in the confectionery aisle in the supermarket. I pretend I'm researching for party bags for the kids... but really Im reminiscing and reliving my childhood. Today, amongst my basket of milk, paper towel, mandarins, smoked salmon and toothbrushes... a little packet of Chiccos made its way into the mix. I tore the packet open before I'd reached the car and gobbled most of them up on the drive home. They cost a little more than 20c but the effect was still the same. It's the small pleasures, folks. Memories!!!! we used to walk down to the service station and I would get Fags (now Fads), disgusting flavoured bubble gum which had a little tattoo in it, nerds, and a peppermint patty... oh yeah! 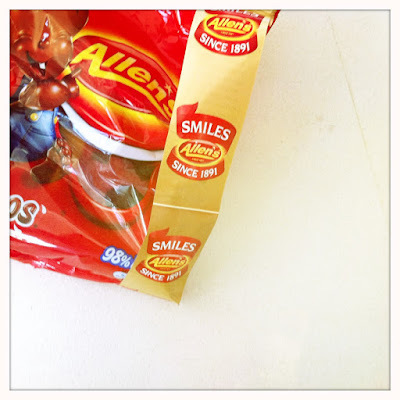 I live not too far from a shop that sells the huge bags of Allens lollies for $10. Its very dangerous, I try to avoid the place! Yes - I loved the umming, aahhing and choosing. I still see kids doing it at our local newsagency and love the deliberation. 20c doesn't get them far though!